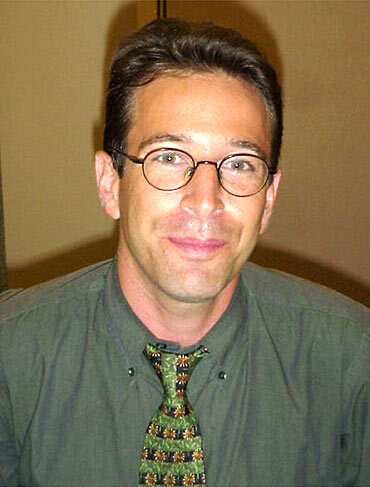 Rediff.com » News » Did US, Pak botch up Daniel Pearl's murder probe? Did US, Pak botch up Daniel Pearl's murder probe? A new report on American journalist Daniel Pearl's killing presents fresh evidence that 9/11 mastermind Khalid Sheik Mohammed executed the reporter in Pakistan nine years ago and four men imprisoned for the crime were convicted on the basis of perjured testimony. 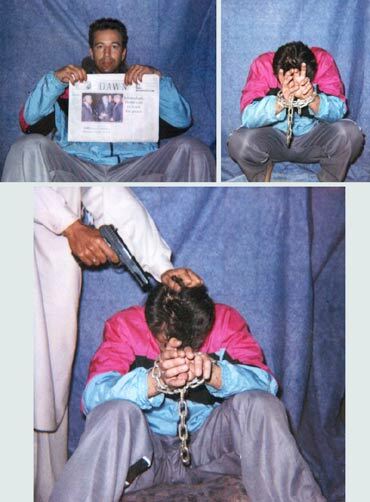 It was reported earlier that Mohammed, an Al Qaeda operative, had confessed to beheading Pearl, a reporter for the Wall Street Journal who was kidnapped in Karachi on January 23, 2002. Pearl had been investigating connections between Pakistani extremists and Richard Reid, who tried to detonate a bomb hidden in his shoe on a transatlantic flight in 2001. The new report, The truth left behind: Inside the kidnapping and murder of Daniel Pearl, says American security and intelligence officials have used vascular technology, or 'vein matching', to prove that the hand of an unseen man who killed Pearl on video is that of Mohammed. However, the report also concludes that four men -- including Ahmed Omar Saeed Sheikh, a British national of Pakistani heritage who was freed by India with two other terrorists in exchange for passengers of an Indian Airlines flight hijacked to Kandahar in 1999 -- were not present during his beheading. 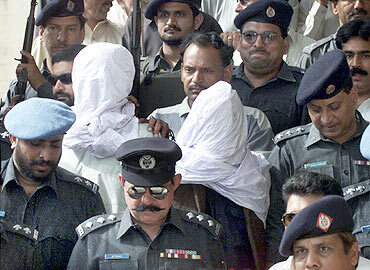 They were convicted for murder because Pakistani authorities knowingly relied on perjured testimony and ignored other leads, says the report. The report said at least 14 of the 27 people involved in abducting and murdering Pearl are believed to be at large. It also contends that the four extremists who were convicted could be released if their appeal is heard because of the false and contradictory evidence used in their trial. 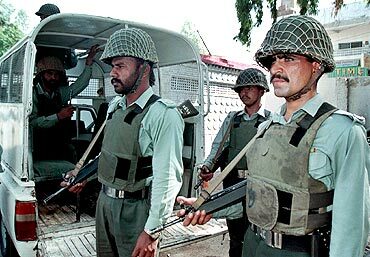 The detailed report, prepared by faculty members and students at Georgetown University and published in conjunction with the Centre for Public Integrity, presents comprehensive evidence about lapses in the investigation and the prosecution of the suspects that were conveniently overlooked by US authorities because of Pakistan's key role in the war on terror launched after the 9/11 attacks. It focuses on incidents such as the week that passed between Ahmed Omar Saeed Sheikh handing himself in to authorities on February 5, 2002 and his formal arrest on February 12, 2002. "This timeline discrepancy regarding when Sheikh was taken into police custody is particularly relevant not just because the evidence contradicts the police's version, but because it speaks to that 'lost seven days' when Sheikh was in the custody of Pakistan's intelligence service, the Inter Services Intelligence -- an event still shrouded in mystery," the report said. Sheikh, described as the mastermind behind Pearl's kidnapping, was sentenced to death in July 2002 while the three other accused were given life terms of 25 years. Appeals against their sentences have been stalled in courts and reports have even suggested that Pakistani intelligence agencies are allegedly shielding Sheikh because he is wanted by India and the US.